Tomas Milian makes his Spaghetti Western debut in this cleverly written, well paced film. Marketing Film R0 German disc. Based on a novel, The Bounty Killer is a largely dialogue based Western with a clever and surprisingly reactionary script. Italy and particular its cinema in the 1960s had some very left-wing inclinations and the Spaghetti Westerns of Sergio Sollima and Damiano Damiani contained very strong political messages. 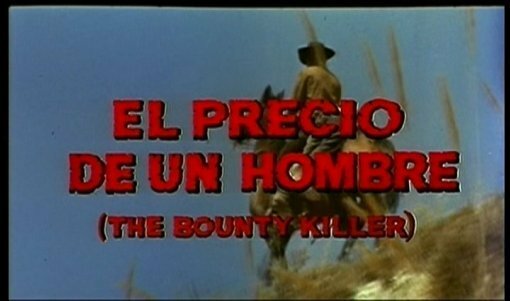 A Spanish co-production, The Bounty Killer is unusual because it contains a more right-wing message - Gómez is revered as a folk-hero by the poor, like the left-wing radical terrorists of the day, however in person Gómez turns out to be a petty but brutal criminal with few morals, interested only in looking out for himself. Eden is representative of the general population, who might support the radicals vocally and from a distance, but would be very shocked to actually meet them. Chilson represents the law who might be unpopular, but may also prove essential. While many of the political Westerns suffered from dragging plots, and gratuitous gunfights to keep the audience watching, The Bounty Killer is well paced with some good dialogue and enough action scenes to keep the film interesting. Spanish director Eugenio Martín does a solid job behind the camera, aided by cinematographer Enzo Barboni (Django (1966) evident in the well shot fist-fight scenes and the effective nice point-of-view angles. The action is more brutal than many of the early Euro-Westerns and there is some realistic looking blood and bruising. Making his film debut, composer Stelvio Cipriani (Reazione a catena (1971)) provides a suitably atmospheric and well suited soundtrack, without the usual upbeat title theme that would have been out of place here. Tomas Milian was on his way to cult-stardom, appearing in the first of 14 Spaghetti Westerns. Although he would normally be cast as a gormless but well meaning peasant, Gómez is considerably more scheming and ruthless and Milian really convinces here. British actor Richard Wyler plays the Bounty Hunter well, alongside a number of familiar genre faces. The Bounty Killer is a strong film with a good mix of action and plot and an unusual right-wing storyline. Ultimately, it is a few years ahead of its time and seems to be commenting on a genre that had barely begun, with almost prophetic casting of Tomas Milian in a harsh satirical take on his usual lovable, misunderstood peasant role. Recommended to Spaghetti Western fans. Anyone famous in it? Tomas Milian - a big Euro-cult star in the 60s and 70s, appearing in a large number of Spaghetti Westerns. Directed by anyone	interesting? Eugenio Martín - A Spanish born director who worked on two other Westerns: Bad Man's River (1971) and Pancho Villa (1972) but is best known for directing Horror Express (1973). Who is it for? A well written and directed picture, recommended to Spagetti Western fans. There are hints of very minor cropping at the sides of the print but seems to be original aspect ratio. The image generally has the look of a very good VHS, with some minor print damage but good colours. There are some scenes that are notably lower quality. Always watchable and much better than most bootleg discs. Audio English mono - sounds okay but rather muffled compared to the other tracks. One short scene in German only. German mono and 5.1 surround - sounds good, but the 5.1 mix is very flat. Some short scenes in English. Spanish mono - sounds good but with notable background hiss. Subtitles English - only for the short scene on the English audio with German dialogue. German - only for the short scene on the German audio with English dialogue. There are no subtitles on any of the special features. Other regions? Japanese DVD with English and Spanish audio, no additional features and not anamorphic. Cuts? The film is believed to be uncut, the print used does not have the longer ending present on the German print. Titles and credits are in Spanish. A well written and directed film with a surprisingly reactionary theme. Recommended to Euro-Western fans. The DVD has relatively low quality print and English audio, but much better than a bootleg and always watchable. Although there is an impressive list of galleries, they are rather tiresome to watch through. See our reviews of more Spaghetti Westerns and Tomas Milian films. All text in this review written by Timothy Young - 22nd July 2006.